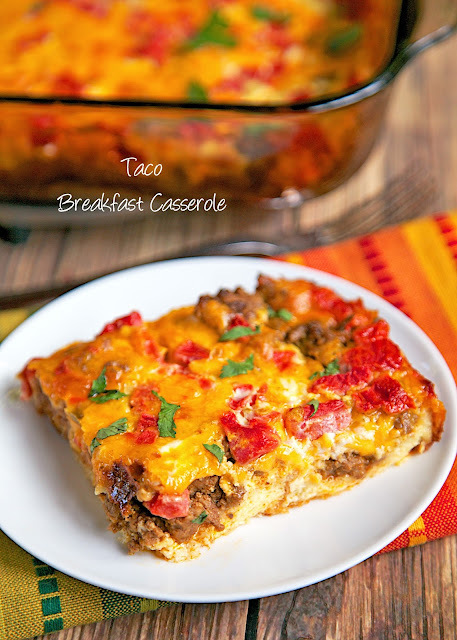 Taco Breakfast Casserole Recipe - Taco meat, eggs, milk, cheese, bread and rotel tomatoes - assemble and refrigerate 8 hours to overnight. SO easy and SOOOO delicious! Perfect for breakfast, lunch or dinner. Would be great for an early morning tailgate! We love to have breakfast for dinner. We aren't big breakfast eaters; we usually have a protein shake or smoothie. I only make breakfast when we have overnight guests or a long weekend. 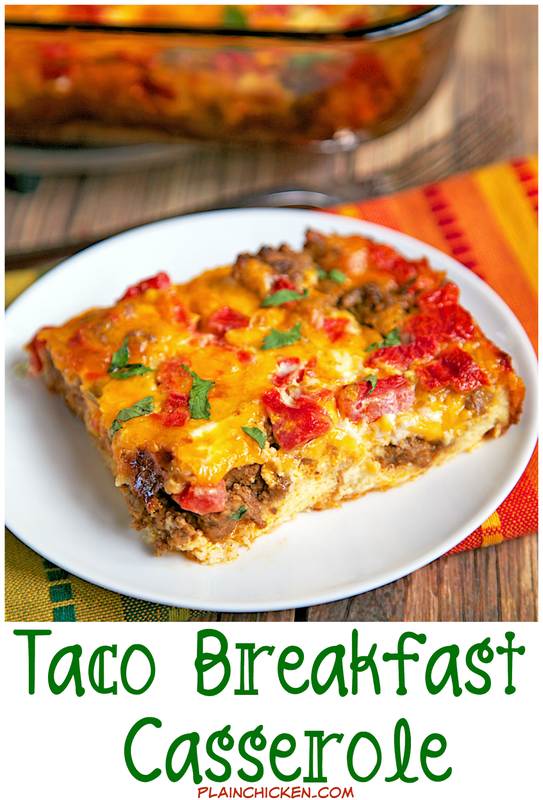 This Taco Breakfast Casserole is SO good. Taco meat, eggs, milk, cheese, bread and rotel tomatoes. All of our favorite things! In a large skillet, cook ground beef until no longer pink. Drain fat and return to skillet, add taco seasoning and water. Simmer for 5 minutes, until most of the liquid is absorbed. Set aside. Butter both sides of each slice of bread and cut into cubes. 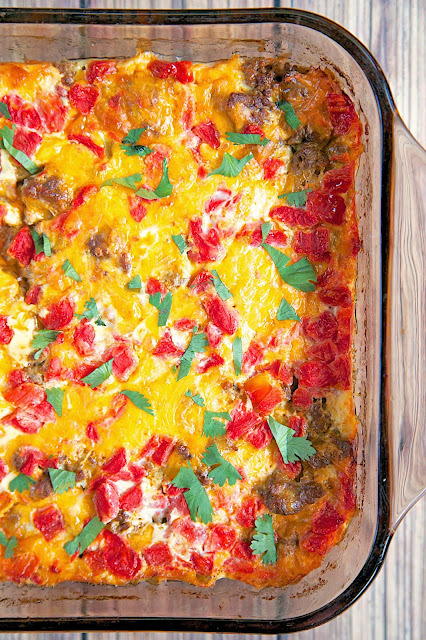 Place in a 9x13-inch dish Top with taco meat and cheese. Whisk together eggs, half-and-half and salt. Stir in Rotel tomatoes and pour over meat and cheese. Cover and refrigerate at least 8 hours. Preheat oven to 350ºF. Bake casserole uncovered for 40 to 50 minutes. We hardly ever make big breakfasts but it's such a treat when we do! 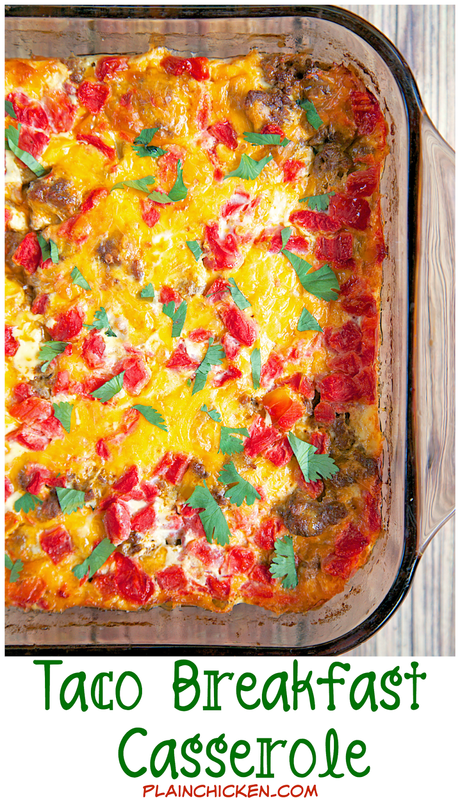 I love this twist on the breakfast casserole! Do you think it would work without the Rotel? I am thinking about making this for my nephews when they sleep over but neither likes tomatoes. What size is the can of tomatoes??? Would this be enough for 8 male adults? Should I double it? It really depends on how hearty everyone’s appetite is. If you are having other stuff with it, one batch is probably enough. If you have big eaters, you will need to double it.